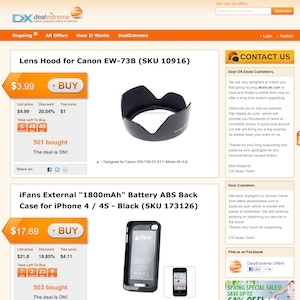 DX Offers was founded in 2011 and is owned and operated by DealExtreme (DX for short), which is known for selling consumer gadgets, electronics and accessories from China. DX Offers is where DealExtreme runs limited time only deals or as DX calls them "Groupons" on those items. While DX Offers was launched in 2011, DealExtreme has been around since 2006 and they are a real hit with online shoppers worldwide. Deals.dx.com currently ranks #11 amongst sites offering online deals -- Barnes and Noble ranks #10. In the General Merchandise category, DX Offers ranks at #8 -- Barnesandnoble.com again ranks slightly higher at #7.